It's been seven years since the bizarre saga that culminated with the release of Fiona Apple's third album Extraordinary Machine. The genesis and recording of The Idler Wheel, her fourth album, doesn't have the same strange backstory but nothing has followed a linear path for Apple since she burst onto the scene with her magical debutTidal. It's difficult to tell how aware she is about the way she's perceived in some corners. It's easy to label her as odd, quirky, or batshit loony some or all of which may be true but it's inspiring when an artist refuses to allow external forces to dictate or influence their art. It's apparent with each album that followed Tidal that she either doesn't know or doesn't care how she's going to be received. The metaphors and wordplay make sense... to her, because she's used to chaotic thought patterns that reach their conclusions in non-linear ways. It takes more patience these days to decode her non-sequitirs and unusual wordplay because they're rarely wrapped in lush musical arrangements or her warm, smokey alto. Idler isn't endless experimental racket and Apple isn't exorcising demons with non-stop banshee wailing. Her art is unwieldy and defiant and any obedience to convention is purely coincidental but there is a payoff for those patient and stubborn enough to sift through chaos. Some artists write a breakup album once or twice in a career but Apple's records all seem to come in the wake of a relationship implosion and The Idler Wheel is no exception. There are tales of smashed relationships and their burning embers and the wounds they've created fuel these songs. "Every Single Night" sparse to the point of near a Capella and no coherent melodic structure. Apple sings and strains between the notes, often singing over silences between mezzo staccato keyboard chords and barely audible percussion. A primal rhythm is pounded out to open "Left Alone," the kind of solo drum piece more often found on prog rock records than a confessional singer/songwriter album. A frantic piano run swiftly kicks in before Apple's unsteady vocal allows her to unravel before our ears. She tells us "I can love the same man in the same bed, in the same city, but not in the same room," completing the thought with a question that serves as its own answer: "how can I ask anyone to love me and all I do is begged to be left alone?" "Werewolf" is musically and vocally accessible, with Apple singing at her clearest and the music built around her percussive piano. The mythical werewolf leaves her for dead, but she is the full moon. She again points an accusing finger at herself, "You were such a super guy until the second you get a whiff of me" but ends with the line "Nothing's wrong when a song ends in a minor key," sounding like both a peace offering and a lesson learned. "Periphery" a bit more pointed than "Werewolf," with blame or incriminations flowing in both directions. She finds herself replaced by a prettier model with a more even temper and realizes she doesn't even like him when the whole thing has come to an end. "Hot Knife" is a bit absurd and unlike anything Apple has ever recorded, making it the perfect way to sign off until we hear from her again. The metaphor of a hot knife through butter has been used before but she doesn't give us a common interpretation or musical presentation. It's musical minimalism with primitive drumming and occasional piano figures beneath overdubbed harmonies, spinning into a cocophany of competing rounds. 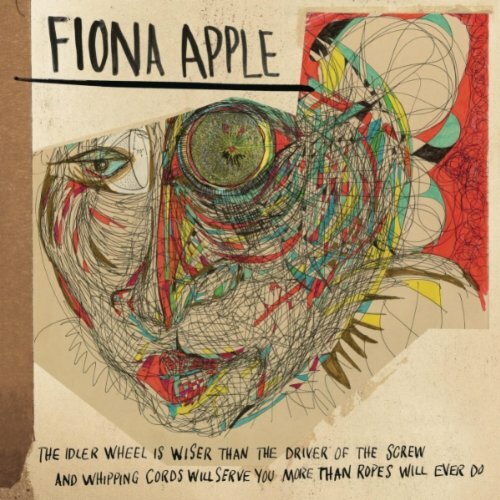 Fiona Apple remains a confrontational, complicated, and sometimes difficult listen andThe Idler Wheel delightfully confounds once again. It's too much to hope for that we'll here from here again soon but among the many pleasures of her records is the abundance of nuanced layers her cycle of songs present. There's plenty to digest until she visits again.